Solid state batteries are making news recently and you might be wondering what it is all about. All companies that are developing electric cars including Tesla and Byton are looking forward to improve affordability and range. Automobile manufacturers have agreed upon the fact that the success of an electric car depends on making the battery long lasting, lighter and affordable. Previously lead-acid and nickel-metal hydride batteries were used to run electric engines which are replaced now by lithium-ion batteries. Eliminating the normal liquid electrolyte, a solid state lithium battery improves energy density, shortens time taken for recharge, and lowers manufacturing costs. The surprising fact is that the battery is developed by a team of engineers led by John Goodenough who is the professor in the Cockrell School of Engineering at the University of Texas at Austin, who is also the co-inventor of the lithium-ion battery (unofficially known as goodenough battery). They demonstrated that their new battery cells have at least three times as much energy density as today’s lithium-ion batteries. Unlike solid state batteries liquid electrolytes can be flammable. So it is much safer to be installed in an electric vehicle. It gives more mileage between charges because it has higher density. Thus it improves the driving range of an electric vehicle as the cell’s energy density is much higher than liquid induced batteries. 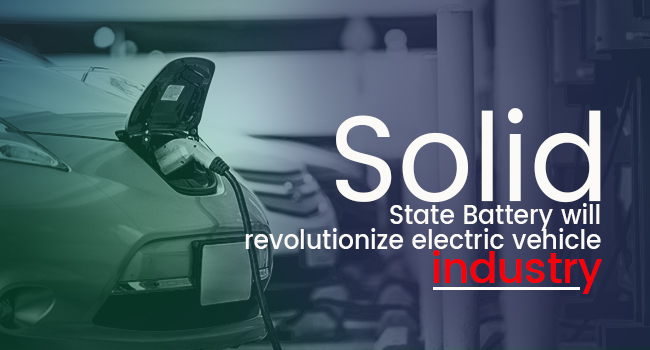 BMW on December 2017 has announced that they are teaming up with ‘Solid power’ a Colorado based battery developer to ditch the liquid based electrolyte lithium-ion cell battery and replace it with solid state batteries which is more efficient, safer and long lasting. The fact is not just BMW is planning to do this. Liquid lithium-ion batteries that are conventional use liquid electrolytes to transport lithium ions between the anodes and cathodes. If the battery is quickly charged it causes ‘metal flakes’ or ‘dendrites’ that may cause a short circuit. In the new solid state battery (goodenough battery), glass electrolytes are used which avoids dendrite formations, and doesn’t lead to a short circuit. By using alkali metal anodes which is not practical when it comes conventional batteries, solid state battery delivers a longer life cycle as it has increased energy density. The new battery uses glass electrolytes that allow the battery to function without the formation of dendrites. Moreover this battery can perform in extreme weather conditions like -20 degrees Celsius and under 60 degrees Celsius. It has high conductivity even in these extreme conditions because it has solid-glass electrolytes. This is one of the best features of solid state batteries. The good news is glass electrolytes simplifies battery cell fabrication and allows to strip and plate alkali metals on both the anode and cathode without forming dendrites. “Cost, safety, energy density, rates of charge and discharge, and life cycle are critical for battery-driven cars to be more widely adopted. We believe our discovery solves many of the problems that are inherent in today’s batteries,” Goodenough said. This is really important for electric vehicles as it will change the future of how it will operate. When compared to lithium-ion batteries of now, these new battery cells have 3 times more energy density. This means increased mileage, more credibility, and better safety conditions. Toyota, one of car making giants, have partnered with Panasonic who are into solid state batteries and is looking forward to create vehicles that have lesser emissions and plans to show its presence in the EV market. Even though they are a bit slow to enter the market they plan to collaborate with the battery manufacturer and be part of the transformation that is happening in the vehicle market. “We’re working with a range of companies, both big and start-up players in this field [battery innovation], so there are two or three candidates for what I would say, kind of game-changing or breakthrough technologies,” said Källenius, the board member and head of R&D at Daimler. Other players in the market like Honda and Mercedes are planning to implement solid state lithium batteries in their vehicles. Sooner or later electric vehicles are going to take over the market and this new technology is going to revolutionize the cars and reduce the emissions. Also they reduce the charging time from flat to a few limits. As this is one of the biggest concerns that solves the issue of the time taken for charging electric vehicles. Let us hope for a future where the use of fossil fuels can be reduced and more of the electric vehicles cruise through our streets. If you don’t know yet, the number of electric cars that are on the road has crossed 2 million. But globally the sales of 95% of electric cars take place in only 10 counties. So it will take a considerable amount of time for it to bring a positive effect upon global warming.